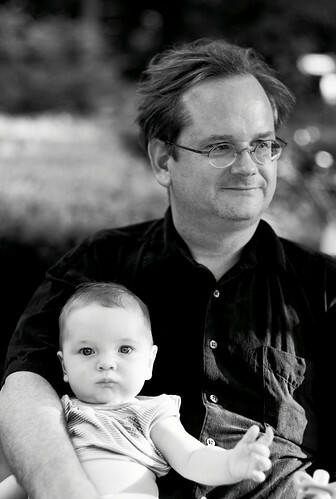 According to Wikipedia, "Lawrence Lessig (born June 3, 1961) is an American academic. He is currently professor of law at Stanford Law School and founder of its Center for Internet and Society. He is best known as a proponent of reduced legal restrictions on copyright, trademark and radio frequency spectrum, particularly in technology applications." I think I met Larry when he was in Japan promoting the Japanese edition of Code and I was on a panel with him. I got to know Larry better when he was in Japan for an extended period in 2002-2003 I think. At the time, I was struggling as an activist in Japan, fighting against the broken democracy of Japan. This struggle and the advice that Larry gave me for how to think about this struggle lead me to write my Emergent Democracy paper and take my struggle to the rest of the world. Larry is a genius at identifying how complex systems such as law, code and politics influence each other. He's able to figure out where the balance is and turn murky complex issues into sharp, understandable thoughts around which movements can rally and debates can be won. Most importantly, Larry throws himself into acting on these causes with a dedication that energizes everyone around him. Larry has really helped me evolve from an armchair philosopher to increasingly more serious activist. When Larry asked me to join the board of Creative Commons, I was honored and shocked, concerned about whether I would be make a sufficient contribution. I was even more surprised when Larry asked me to be the chairman of Creative Commons and I'm still concerned about my ability to play the kind of role that Larry expects from me. However, Larry hasn't left me with much slack or time to wallow in my lack of confidence and the combination of his confidence and firm leadership is pushing me to have to grown quickly into my new position. Larry is the mentor of mine who sets the standard of high-quality, no-compromise dedication to our higher causes, showing that there is no issue too complex or large that we can't make a difference with enough commitment, persistence and focus. Always looking for an excuse to comment on Emergent Democracy. It seems right now there should be a struggle to free the idiotic controls on distribution of information about the candidates for the Diet Election. I just read that candidates are not allowed to change their websites for 17 days before the election. Joi Ito - "Lawrence Lessig" by Joi Ito is licensed under a Creative Commons Attribution 4.0 International License.